Captain Kevin Malone, a native Nevadan, was raised in Humboldt County. He has proudly lived here for the past 36 years. Kevin began his career in Law Enforcement in 1998 with the Nevada Department of Corrections and has been a member of the Humboldt County Sheriff’s Office since March of 1999. While serving with the Sheriff’s Office, Kevin has been assigned to Detention, Communications, Patrol and Investigation Divisions as well as the Special Response Team. In 2006, he completed the NAEMT Basic EMT certification and began combining the duties of a patrol deputy and a medical responder. In August of 2009, he completed a Tactical Medic certification in Cypress Creek, Texas and in January of 2014, graduated from the first Humboldt General Hospital EMS-Rescue Paramedic Program. Then in January of 2015, Kevin was promoted to Captain by Sheriff Mike Allen, supervising the agency’s Patrol and Investigation Divisions, as well as the Reserve Deputy and Coroner Programs. 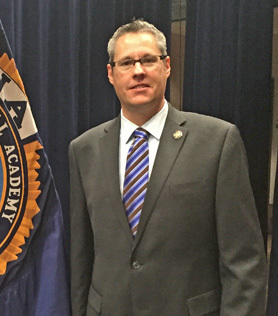 Kevin is a graduate of the 263rd session of the FBI National Academy and is recognized as a Fellow with the International Association of Coroners and Medical Examiners. Prior to Captain Malone’s career in Law Enforcement, he served in the U.S. Navy as an Aviation Boatswains Mate (Launch and Recovery equipment) stationed aboard, the now retired, USS Kitty Hawk Aircraft Carrier. EMT with the Humboldt General Hospital EMS-Rescue since 2006. Volunteer First Responder/EMT with the Winnemucca Motocross Club, 2001-2012. Captain Malone is happily married and he and his wife enjoy spending time with their two dogs.